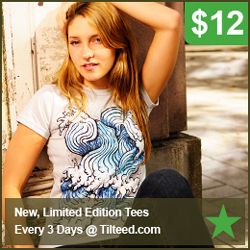 Tilteed tees has limited edition designs. At $6 up a t shirt, a chance to win a shirt daily, and $500 prize for a t shirt design contest with this Tilteed review, shopping at one of the most popular graphic art t shirts online store has a lot of advantages. Nearly everyone has a favorite t shirt. This shirt might be old and has stood the test of time. This type of clothing are often worn and re-worn for years. What are the reasons why a tee becomes the favorite one? Comfort and looking good in it might be the 2 main reasons why. > A t shirt that can be the new favorite. >> Unique design t shirts that hardly anybody else has. 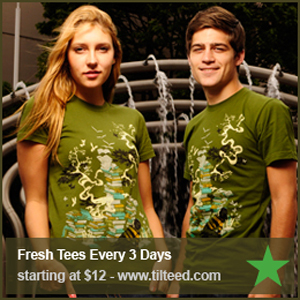 >>> Latest graphic art t shirts that are trendy. >>>> Fashion statement tees without words. >>>One that is made with quality material. >> A well-known t shirt brand. Kids can be so picky nowadays. Teens, especially stylish ones, are even more choosy. Was there ever some new clothes that simply got shoved in the closet? They may have a particular style that identifies their personality and likes. Many of the youth are into Slytherin green, pale blue, or beige shirts. There are the ones who like animal prints, skulls, or funny art work. What makes this t shirt store a cut above the rest? These are the t shirts that are called awesome. Cute, made me smile, happy, love the character, are the other words that are used to describe the individual shirts reviews by the Tilteed Club Members who log in using their Facebook or Twitter accounts to join the conversation, win t shirts daily, and be able to submit their original art work to the Tilteed t shirt designing contest. There is a Current Tee display that something similar to a daily deal which sells the item at low prices. The other feature of the Current Tee is that after the time period has elapsed, it will no longer be for sale - which means it will totally disappear and no one else can get one like it. For the ones who want unique and cheap t shirts, this is the way to get them. To top of the tees, a hoodie is vital. 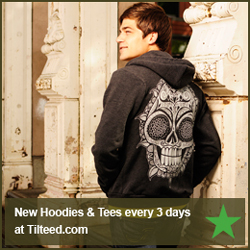 And the coolest printed hoodies to keep one warm and fashionable are at Tilteed. Large graphic art on hoodies that is in or a timeless design, check out the great hoodies at Tilteed. Cheap t shirts and hoodies made of quality material with the latest designs is what this Tilteed review offers. A community of t shirt lovers, a chance to win a shirt daily, and to submit a design to have an art work made into a brand t shirts - plus to be able to buy unique shirts - there are more reasons that one to buy the cool tees of Tilteed. Check out the Tilteed Current Tee right now before the timer runs out and the chance to buy it is gone forever. Have you used the Tilteed? Share your review!